Secrets for the tricks in this book, if purchased separately from magic supply houses, would cost well over $1000. Here, in non-technical language, are hundreds of tricks that require no special apparatus; tricks that can be performed with simple, common objects to be found anywhere. Tricks with coins, rope, handkerchiefs, cigarettes, rubber bands, pencils, playing cards - objects completely free of trickery. 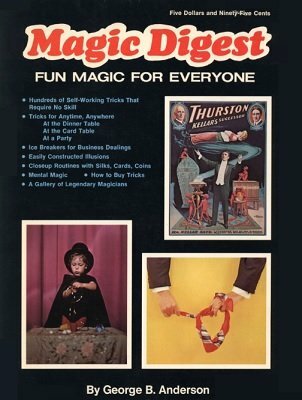 Includes complete routines for a close-up act, a mental act, a children's show, and a catalog of magic and merchandise. "Puts Magic in the Now! I recommend this book to everyone interested in the Art of Magic, be he amateur or professional. For the first time in decades a book has finally come along that puts Magic in the contemporary scene, all the dusty old myths have past into oblivion." Another "Think Of A Card"
The Hoax "Think Of A Card"
1st edition 1972, 288 pages; 1st digital edition 2016, 490 pages. This George Anderson knew his magic. If that is not enough there are two really entertaining bonus sections. One reprints the bizarre tricks of the ancients and the other a runs a cross-section of honestly amazing advertisements for tricks sold by dealers in magic equipment. Most of these items were 'the latest' when the book came out in the early 1960s, but almost all of them are either white hot collectable now or displayed as museum pieces.